The Royal Canadian Mint opened ordering for the 2016 $20 Tyrannosaurus Rex Silver Coin, the latest issue from its popular series of 99.99% pure silver coins that sell at their legal tender face values. This one should be another hit, especially with youngsters. Known as the king of dinosaurs, the enormous T-Rex is recognized around the world. Fossilized reconstructions make them a centerpiece in museums and imposing CGI recreations have made them stars in films such as Jurassic Park. The T-Rex coin marks the 19th issued in the product series that launched in 2011. All but the most recent coins have sold out. Two more $20 for $20 silver coins are scheduled for 2016 with the $20 Batman v Superman™ Coin coming in February and a third design, yet to be announced, arriving in May. 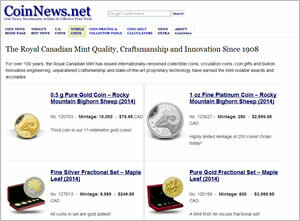 In December, the Royal Canadian Mint started accepting subscription orders for this year’s coins. Subscribers have already received shipping confirmations for their T-Rex coin. Designed by Julius Csotonyi, the reverse or tails side of the coin shows the tyrant lizard king charging with opened jaw and jutting teeth. Inscriptions around the design read: CANADA 2016, FINE SILVER 9999 ARGENT PUR and 20 DOLLARS. Susanna Blunt’s portrait of Queen Elizabeth II appears on the obverse or heads side. The likeness of the Queen is surrounded by ELIZABETH II and D G REGINA. Each coin is placed inside a protective clear pouch that is attached to an illustrated display card complete with specifications and a certificate of authenticity. The card features an image of a T-Rex in what would have been its natural setting. 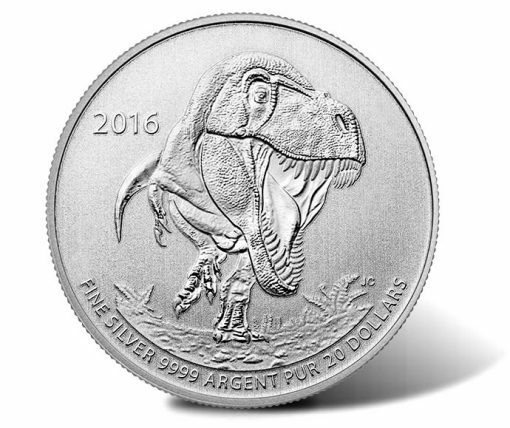 Limited to 300,000, the 2016 $20 Tyrannosaurus Rex Silver Coin is available from the Royal Canadian Mint at mint.ca. The following affiliate link goes to the Mint’s $20 for $20 page where the coin is listed as well as the previously mentioned subscription option. There is a household ordering limit of 5 coins. The Mint ships them free and does not charge taxes. This story in the US coins section ? Do you feel lost? 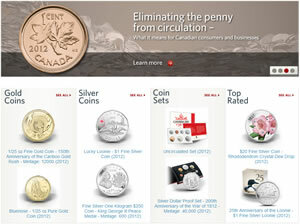 This is the ugliest design in the RCM’s $20 for $20 silver coin program since it started in 2011 ! I have a number of them, but this atrocity will not be one. The view is off balance severely on this design. This coin design will cause kids to have nightmares! BOO ! Lol. The real loss is $20 for $3.5 of silver – Not stomping away from my wallet. I actually do not own any of this series. Admittedly in the past I’ve never been a big fan of these coins. But I’m in on the Batman V Superman in February. Highly collectible. You got it totally right! I got the household limit on the 2015 Superman $20 for $20 silver coin from the Royal Canadian Mint (RCM) because the design was fantastic & as you say a very popular subject matter. I can’t wait to receive the $20 for $20 Batman vs. Superman coins in February since it has two superheroes on it & as you said will be highly sought after (by coin collectors & comic book aficionados too)!